It's getting to be cabin closing time in Minnesota; the air is crisp and damp and fall is definitely in the air! 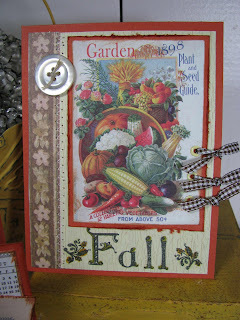 Tonite I played in a Crafty Secrets design team challenge and decided to go "fall" with my cards for the challenge. Our challenge was to use Crafty's Artsy Alphabet on any project. Here I used an image from Crafty's "Summertime" booklet, but paired it with rust colored cardstock to make it more fallish. I love the wheat and pumpkin images on this seed catalog! 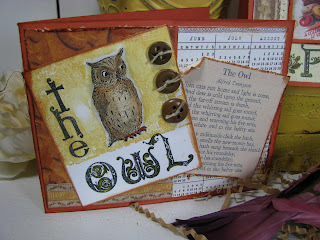 I've also been meaning to use this owl from Crafty's "Booklovers" set, and I found the perfect opportunity to use him! Last weekend at Haupt's Antique market, I bought a book of children's poems, and one of the poems was titled "the owl". I photocopied the poem and shrunk it down so that I could use it on this card. 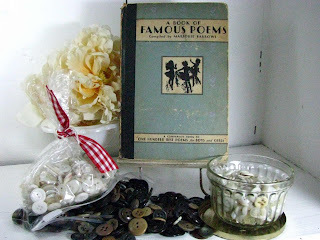 I also scored vintage mother-of-pearl buttons for $2.00 a bag. They also had choose-your-own buttons for $2.00 per bag. I stocked up on black and brown ones for fall & halloween! 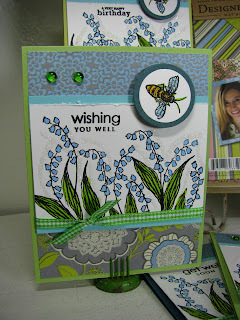 Also, don't forget to check out the other design team girlie's challenge cards on their blogs! Happy Monday! I've been selling Halloween cards at work like CRAZY lately! 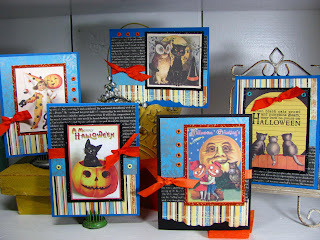 People are going nuts for the Crafty Secrets Halloween Booklet images, so I just keep crankin' em out & bringing them in! I used up a ton of eyelets to get rid of them. I've also been having fun glittering the matting on these images with Martha Stewart Onyx and Fire Opal glitter. 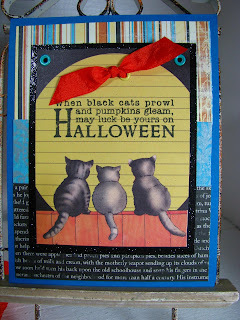 I took black cardstock, cut it to size, and then went right over the top of it with black glitter, for maximum effect! 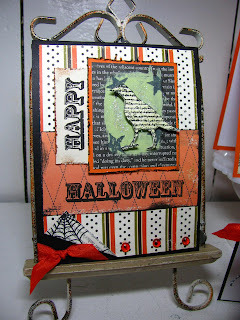 Same with the orange; I used Pumpkin Pie cardstock, then went over just the edges of it with fire opal glitter. Here's some closer photos so you can see the glitter effect up close and personal! Happy Thursday! YAY! The lights came back on & we've got power again! It's a thunder-stormy night here in MN. I was convinced I wouldn't be able to blog because the power was off tonite from the storms! 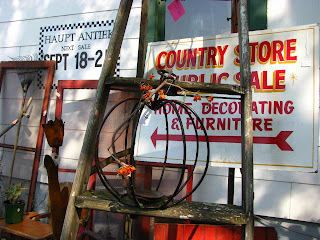 Tonite I have inside photos of the Haupt's Antique Market in Rosemount, MN! 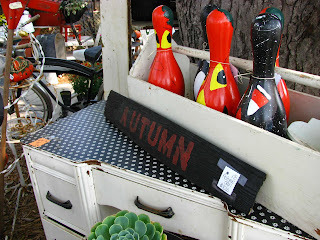 They had such cute displays of junk everywhere! 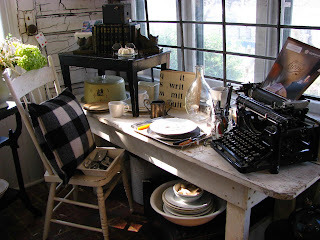 Check out the cute typewriter and the sweet little wooden table! 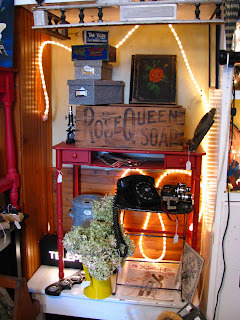 Junker me, in junker heaven! 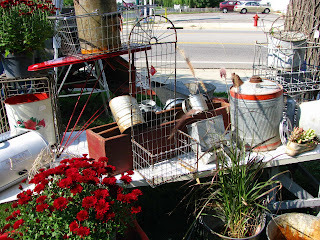 Red and white junk! My favorite color! 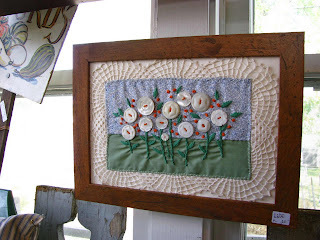 How sweet is this button wall hanging? 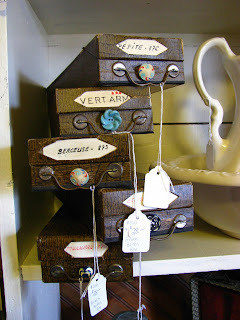 These french button boxes were so beautiful...the buttons they once held were to die for! I would have snapped these up in a heartbeat, had the buttons been in them! 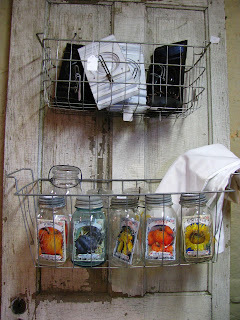 Cute ideas for wire baskets! 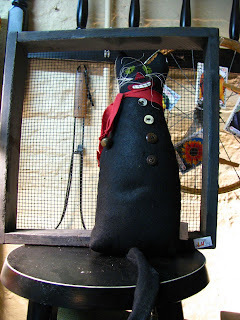 Hang 'em on a door or a wall! Pretty much the story of my dating life, lately! More black & white junk! 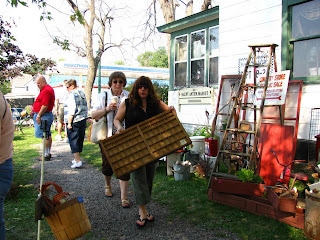 The exit out of the antique market. Sigh. I will clear out some space in my house and return next month! 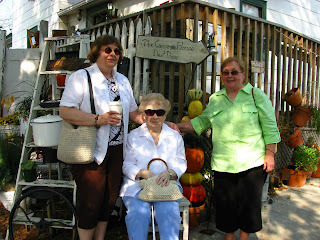 Haupt Antique Market - Annual Birthday Girls Trip! 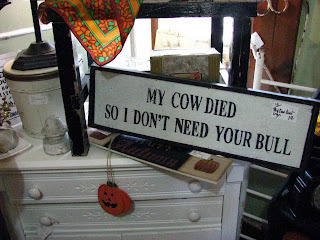 I'm sorting through my photos today from our September 'Birthday Girls' field trip yesterday to the Haupt Antique Market in Rosemount, MN. 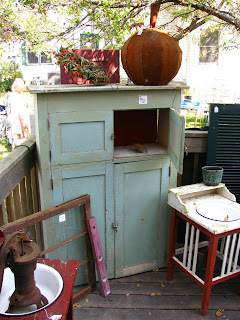 This is junking at it's absolute finest! To celebrate my Mom, Aunt Jan's & Grammies birthday, we pick a new junk spot every year and pack up the van in search of treasures and junk! 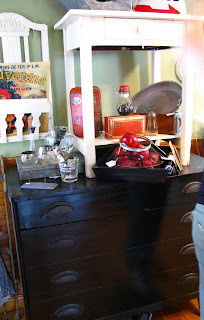 This year we explored Rosemount, MN, which is a sweet little town on the outskirts of Eagan, MN. 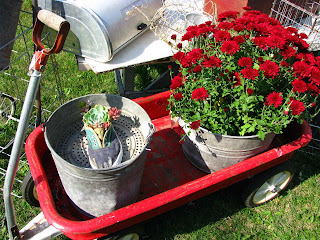 Going to Rosemount feels like taking a trip into the country, without the long drive! It's so close to the cities that it's easily accessable any time! One weekend a month, Haupt's opens up to the public with more cool junk and a new fun theme; this month the theme was "Noir & Blanc", black & white. 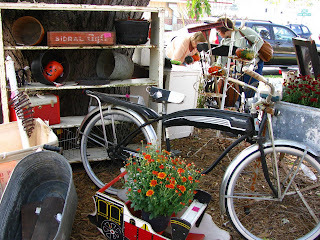 I was in awe of their displays of junk and their eye for cool ways to repurpose stuff. I wanted EVERYTHING IN SIGHT! Unfortunately, my house is pretty full to the brim, so I exercised restraint. BOO! So I'll be content today to show you guys all the goodies and ooh and ah over them on my blog instead. I will just tell you guys one thing...if you are in Minnesota or Wisconsin, it's so worth a trip over to Rosemount to wander through Haupt's. You will depart with inspiration galore! Here are the birthday girls, ready to hit the ground running. 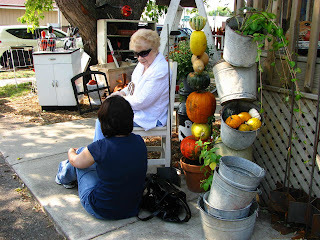 Well, except for Grammie, who was content to hang out in the shade on a comfy chair and let the crazy junkers run around and do their thing! 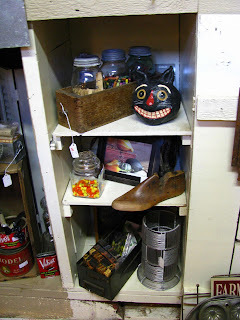 OOOH THE JUNK! Seeing it just makes me excited all over again! Maybe I need to go back again today. Cutest of all cute bikes EVER! 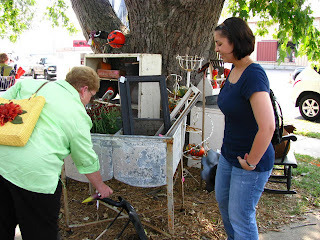 My cousin Jessie and Mom checked out the metal bird "junk". Apparently Jessie just isn't into the bird junk. 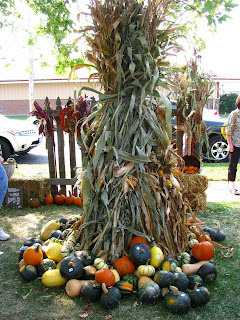 This is what bowlers have on their front steps at Halloween. I need to get me some of these. DID I MENTION I'M A BOWLER?!?!! HEH HEH. My sister Gina and Auntie Jan were trying to be helpful here and organize me and my stamp room with this cool typefont drawer. They imagined me putting all my stamps in it & hanging it on the wall. I didn't have the heart to explain to them how many stamps I own and that this wouldn't even crack the surface of the piles. I also thought maybe a stamp intervention may ensue if they had a clue what's in my stamp room. I WANTED THIS DESK IN THE WORST WAY! Only $38 bucks! 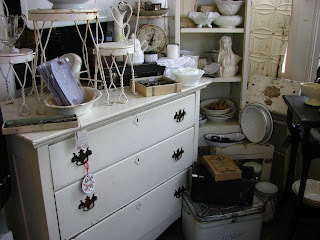 But some of the drawers didn't open, and, well, I HAVE NO ROOM FOR IT! 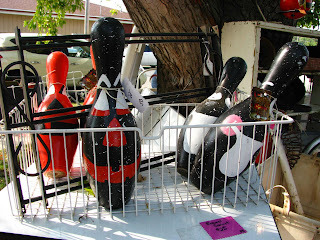 And more bowling pin-kins! Check out the little plant on the left...it's planted in an old sneaker! 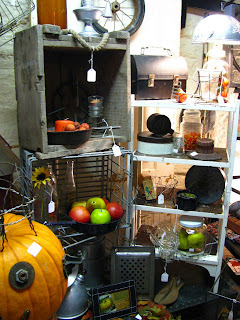 MORE CUTE JUNK & WIRE BASKETS! Jessie coppin' a squat with Grammie. 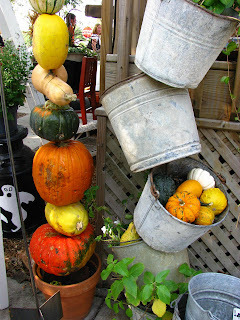 See the cute little display of gourds and buckets? 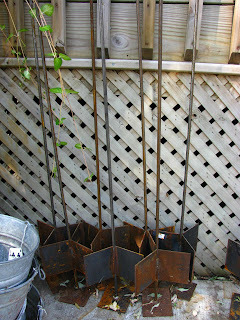 They were selling these cool metal stakes that you could pile gourds on or drill holes in buckets for plants. SO INGENIOUS! Next post, we'll go INSIDE! 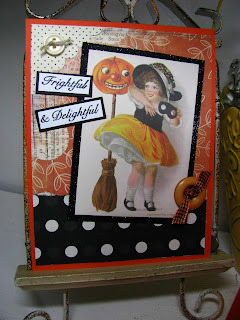 Making quick Halloween cards doesn't get easier than this! 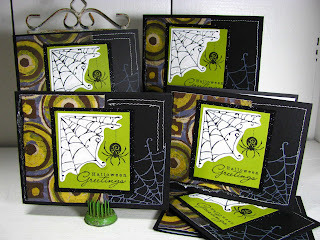 These are part of the multitudes of quick Halloween cards I made at the cabin last weekend for my card stash. 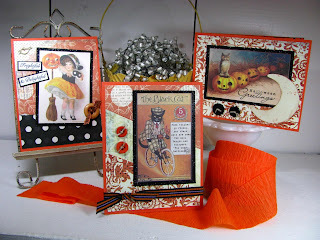 Most have very minimal embellishment because the cool Crafty Secrets images from their Halloween Image and Journal notes booklets do the work for you! I matted them with black cardstock and glittered the mats up with Martha Stewart Onyx glitter so that they sparkle. 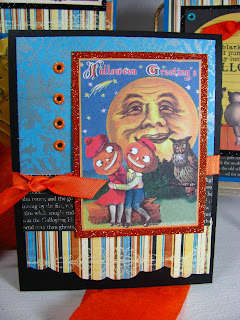 I used papers from Pink Paislee's Vintage Moon Collection; the cardstock is called "Harvest Moon", Full Moon and "Moon Pie". 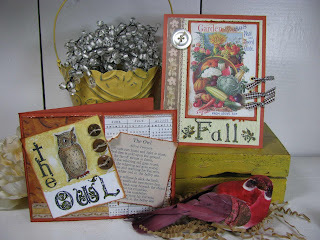 LOVE the autumn feel and shabby look to these papers! 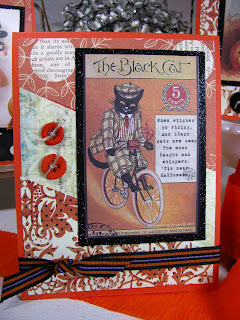 I've made cards with this cool black cat image before; he's one of my very favorites! Fall is gone from Minnesota right now; we've been having 80 degree weather lately. 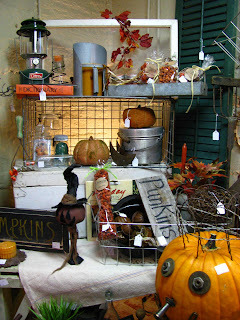 Tomorrow should be beautiful for our annual family girls junking trip! 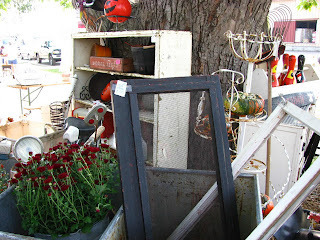 Tomorrow we are headed to Rosemont, MN; I'll take photos of the cool junk and take you with if you're interested! More to follow! Happy Friday! 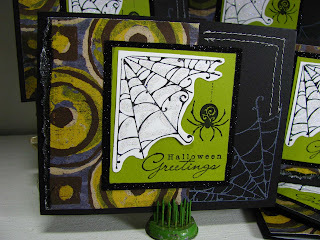 I cranked out the cards again this weekend; this time with a Halloween theme for my card stash at work. 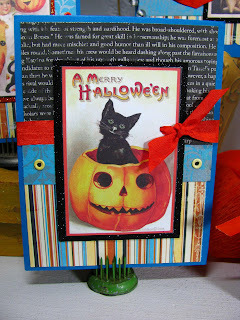 Last year I had a run on Halloween cards, so I'm being prepared this year and getting cards done early, just in case! I did another limited supply haul to the cabin to work on cards, and also brought a pack of new Stampin Up "In colors" assorted cardstock. I'm LOVING every color this year! 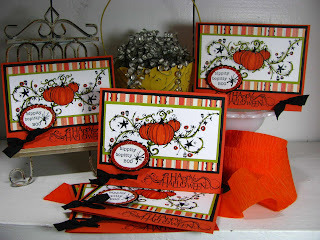 I tried out the new orange with these pumpkin cards; I'm traditionally a "pumpkin pie" cardstock lover, but this new orange may make me cheat on pumpkin pie this year. The stripey patterned paper was on clearance at Anchor paper, and is called "Funky Stripe" by Making Memories. 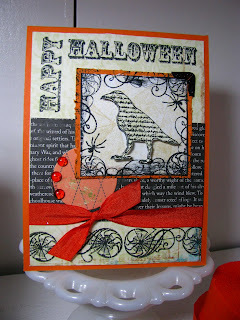 The stamp set is by Inkadinkado from Michael's, "All Hallows Eve". 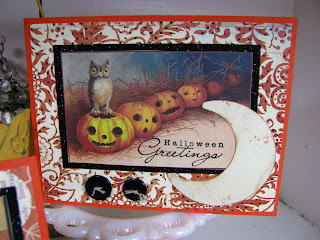 I also used Anna Wight's "Spooky Expressions" set by Whippersnapper...my Mom noticed me stamping the swirls around the pumpkin and said "OH you have to use the bippity boppity boo sentiment, because it looks like Cinderella's coach!" I love each and every funky sentiment from Anna's set! WOOO HOO! I finally got some stamping time in tonite! 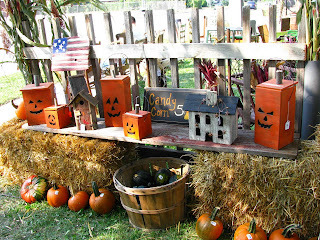 I'm allowing myself to do Halloween stuff again now since it's been getting cold out at night and is starting to feel fall-ish in Minnesota. This is my FAVORITE time of year, and I always enjoy the crisp weather, nesting at home and digging in and creating with orange and black. Tonite I played with a new stamp set that I bought last month at Archivers with my coupon. The stamp set is called "Spellbound" and is by Making Memories. It's a bit out of my comfort zone because I enjoy coloring line art images so much more than the solid image stamps, but it was fun to step out of the box and try something different. This raven was a challenge for me, because it felt like he should be solid black. But then you couldn't see the great scripty writing going across him. So I tried to create a black feeling by using the black background paper behind him. I also used some Making memories paint in the background to help him pop off the paper more. 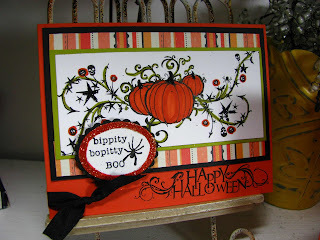 I love the font of this Happy Halloween sentiment stamps. The orange dots are more of the floral arrangement "luster gems" by Darice (given to me by friend Carol). I colored them in with a Sanguine Copic Marker. 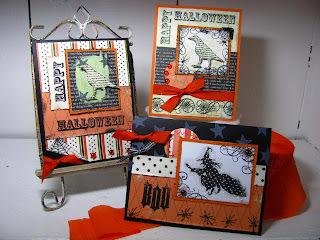 Patterned papers also by Making Memories, from the "Spellbound line. Hi all! I feel like I should apologize for dropping off the face of the earth for a week... 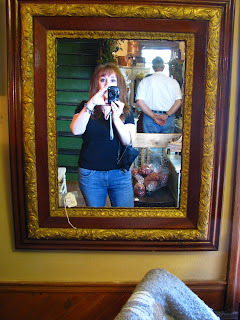 I had a friend call me tonite to see what was wrong because I haven't blogged in days! It feels like ages since I've had a stretch of time to be able to sit and stamp, but I'm vowing to do it at the cabin this weekend if it KILLS me! So I'm gonna post more Flourishes cards tonite that I did at the cabin a few weeks ago. Remember my 'limited' supply challenge, where I brought just a small bag of stuff and one small patterned paper pad to the cabin? Well these were more of the cards I cranked out with that small stash of supplies. 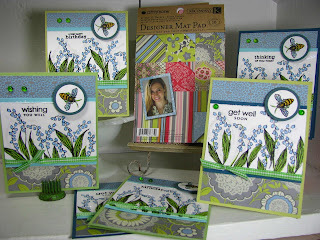 These cards were done with the Flourishes "Peony" set, which comes with a ton of cute little lily-of-the-valley flowers. I stamped them at various angles, colored them blue and turned them into bluebells to match my limited supply paper! Okay, so they're not bluebell leaves technically, but a girls gotta do what a girls gotta do in a pinch!